“The swaying torso and the constant shifts remind one of the swaying palms and the undulating waves of the sea in God’s Own Country, Kerala,” writes Rashmi Pai-Prabhu. There are good chances that you have been to the older, quainter parts of Bengaluru. It was to the surroundings of JC Road and particularly to the ADA Rangamandira, very close the much revered Town hall, where we were headed on Saturday, 29th September. The event we planned to attend was a Mohiniattam and Nangiar Kootu performance. Mohiniattam is one of India’s eight classical dance forms and has its roots in Kerala. It gets its name ‘Mohini’ from the famous female enchantress avatar of Lord Vishnu and is sometimes termed ‘the dance of the enchantress’. Mohiniattam is an exceptionally graceful dance form and is performed largely by various angles of the swaying torso and the constant shifts in the levels reminding one of the swaying palms and the undulating waves of the sea in God’s Own Country, Kerala. Nangiar Koothu on the other hand is a solo performance with an antiquity of 1500 years. It is the sole domain of female artistes, originally performed by the Nangiar amma, the female members in the Nambiar community. While the dance event was aptly titled ‘Temple Arts of Kerala’, we were as intrigued by the background and rich cultural heritage of the dances. We were equally enthralled by the dedication and enthusiasm of our friends, the dancers, Dr Vandana Nadig Nair, Bindu Ramanathan, Nirupama Kamath, and Priya Krishnadas. It is indeed remarkable and noteworthy how these lovely ladies could manage to juggle very successful careers while training relentlessly and devoting endless time and energy to pursuing their passion. It was also interesting to note how this dance event was marked to celebrate World Elders Day and honour our senior enthusiasts. Couple of rows reserved in the front for senior citizens drove the point home. Conceptualised and supported by Elder Aid Wellness Pvt Ltd, the event sought to revive and create a much need interest in ancient and classical art forms while contributing the proceeds to flood relief operations as well. The evening started with an Ananda Ganapathi, an invocation dance of sorts seeking the blessings of lord Ganapathi. A solo performance by Dr Vandana Nadig Nair, she enthralled us with her expressions and charm while seamlessly executing the numerous undulating dance movements with fluid grace. Mukachalam, a pure dance item in Sopana style which followed next, was a duet by Dr Vandana Nadig Nair and Nirupama Kamath. Matching step for step, the synchronization and camaraderie between this guru-shishya duo was at its unbelievable best. As audience, we sat enchanted in our seats as they rose and dipped in unison, swayed with grace and sashayed their way into our hearts. Varnam, performed next, was a slightly more elaborate and intensive piece. Here it was as much the drama and expressions adorned by the renowned performers, Dr Vandana and Bindu Ramanathan that mesmerised us as the seemingly effortless portrayal. After a short break, Nangiar Koothu was the next event. Interestingly, an explanation of sorts regarding what to expect, replete with hand mudras and expression, was given to the enthusiastic audience before the start of the performance. 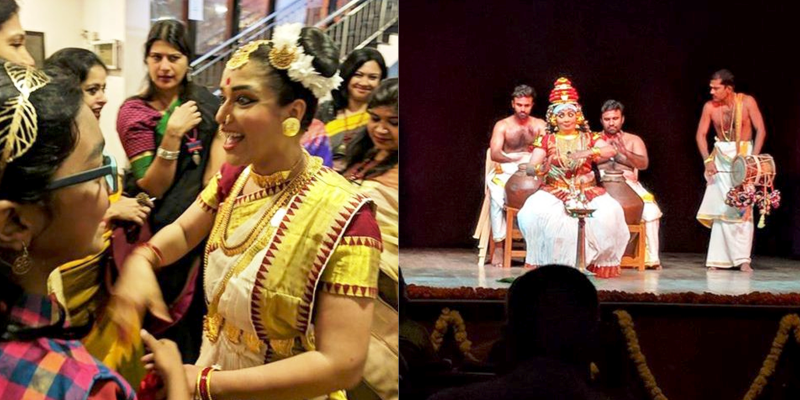 Also a trained Mohiniattam performer and teacher, Danseuse Priya Krishnadas captured the audience attention with stories of Lord Krishna depicted through hand mudras, facial expressions and body movements to the accompaniment of the classical percussion instruments namely the mizhavu and edakka. Last but not the least, a word for Nrithyaami, the dance school that worked extensively to piece it all together. Under the able mentorship of Guru Jayashree Mundkur and operating from several parts of Bengaluru, this dance school which literally means ‘I dance’, is for those who wish to discover their true calling.